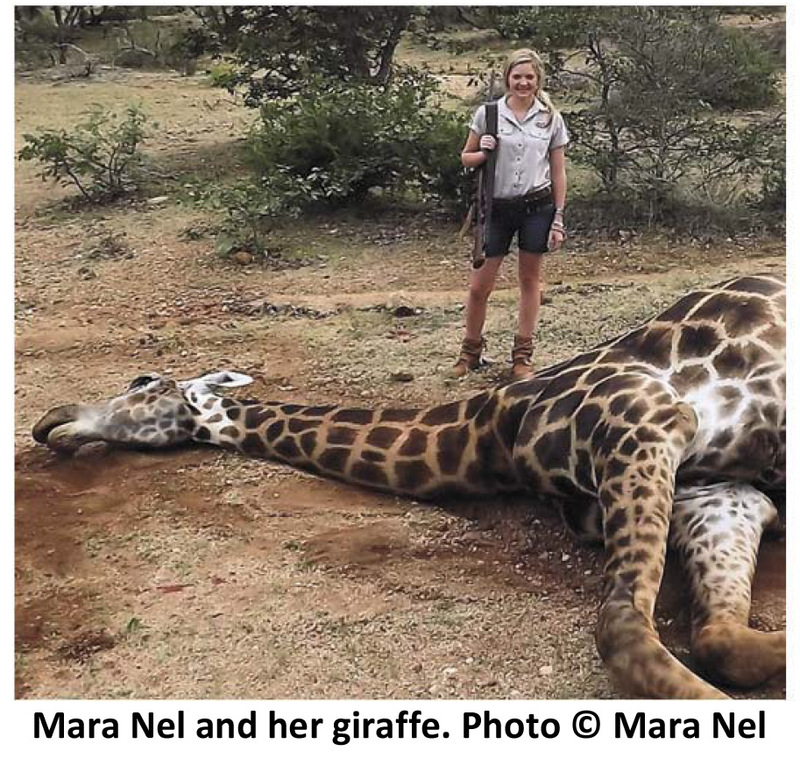 Editor’s Note (G. Damm): After Mara Nel tweeted a photo showing her with a giraffe she had hunted in Maroi conservancy in South Africa she was subjected to a firestorm of hateful comments. But luckily there are people who think beyond emotions. On February 5th, 2014, Brian Sirimaturos blogged under the headline “The Power of a Viral Photo” … A couple of days ago, a retweet came through my Twitter app on my phone with a simple picture attached … A hunter standing over her latest kill. A giraffe … By retweeting the original post, I was now part of a firestorm of social media virality. It took off from there. So over the next few hours I monitored what was said … At first I was like, “Yeah, get her,” but then something happened. The tone got out of control. Nasty. Ugly. Threatening. People on MY SIDE broke down into sophomoric name calling and threats … Here she is getting called every name in the book, firing off replies and comments one right after another, and I get a very calm, rational reply. Also, her comment about wanting to give ‘her side.’ … OK. Let’s see about “her side.” So I connected with Mara to set up a Q&A of sorts to get her side of the story. I made an effort to let her talk and answer as she saw fit and I only asked a couple of follow-up questions when appropriate – and hopefully without much emotion. I found my twitter account completely overrun with hate speech, death threats and hurtful comments from people all around the world after I posted a photo of myself standing next to the giraffe that I had hunted on our game farm in South Africa. Defending me and justifying the hunt was the only sensible thing to do. I wanted those people, who would have rather liked to see my head mounted on a wall, to take a moment before sending hate mail. They should at least take into account our different live styles and our point of view. I can understand why people are against hunting; I don’t agree with it, but I respect the way they choose to live their lives and I will never belittle their choices because they are different from mine. Between all the messages that were being flung my way, there was only one person who was neither supporting the way people pouring out their scorn, nor was he agreeing with me having hunted the giraffe and tweeting the photo. For some reason Brian sounded as if he would be willing to listen to my side of the story. Already his first message changed my entire attitude and I immediately had a lot of respect. Later I realized that my conversation with Brian also changed my way of responding to people who disapprove hunting. Brian thought it would be an interesting idea sideline the “emotional part” of a subject; emotions would be replaced by asking questions and exchanging viewpoints in a calm and rational way. This is certainly not the usual approach of a person who does not agree with or like hunting. Brian, a professional photographer, wanted to discuss a few questions, and he proposed to post the dialogue on his website along with the photo, when all was said. He approached the subject along the line “how powerful pictures can be and the story behind them”. His straight forward questions were not one-sided like as I expected. Instead of trying to tell me how I should feel as a hunter, he was trying to learn why I am able to kill an animal and have a photo taken with a smile on my face. My difficulties in explaining could also be the reason why hunters lash out at people who are against hunting when faced with questions that they have not really thought through. Brian noted that we all go into a discussion with some pre-set emotion and belief, but before you can make an educated decision, you have to know what you are talking about. Brian’s aim was to learn, not to attack me or to confirm his initial assumptions. He mentioned that in order to understand either side and the “why”, you have to approach the subject with an open mind and check your emotions enough for a mature discussion. This approach is the one we need between hunters and anti-hunters. Hunters need to understand why people don’t like hunting, something no one teaches us; yet it comes with the responsibility of being a hunter and sharing the success of a hunt on social media. Most debates, articles and blogs that try to address this are very one-sided and state either the very good or the very bad. The subject is controversial; some are against hunting full stop, others are against trophy hunting only, and/or disapprove unethical hunting such as canned shooting, or only find it wrong to hunt certain species. Hunters are just as different, some people hunt to provide meat for the family, others travel the world to hunt and collect different animals. I believe that Brian and I learned a lot from each other during our Q&A; some subjects we could agree upon, like canned shooting or cruelty to animals. We realized that things are rarely black and white; and often you have more in common on a particular subject than you initially expect. Where does the line get drawn? Who gets to decide who the bad people are and who the good people are, if assumptions are based on merely a single photograph? Would knowing more of a person change the way you think of them? One thing has become very clear to me, when you do something or live in a certain way that is different from another person, you get told exactly who and what you are. You don’t get asked, you get told. Hunting is an emotive subject; consensus will never be reached, but why turn to name calling, death threats or hurtful comments? We are all different; why should anyone have less of a right to live a chosen lifestyle? You may never agree to hunting, and what I write might not change your mind. Others may think it’s completely ridiculous that people devote their lives to saving animals and giving animals a voice. It does not matter where you stand, but if you have the time to say your say, then you should also take the time to educate yourself on the subject from every perspective. Note: Mara Nel was born and raised on a game farm in South Africa and hunted since a very young age. Mara obtained her professional hunters license in June 2013 and works now as a professional hunter at Maroi Conservancy during the holidays. She is currently a 3rd year Zoology and Physiology student.